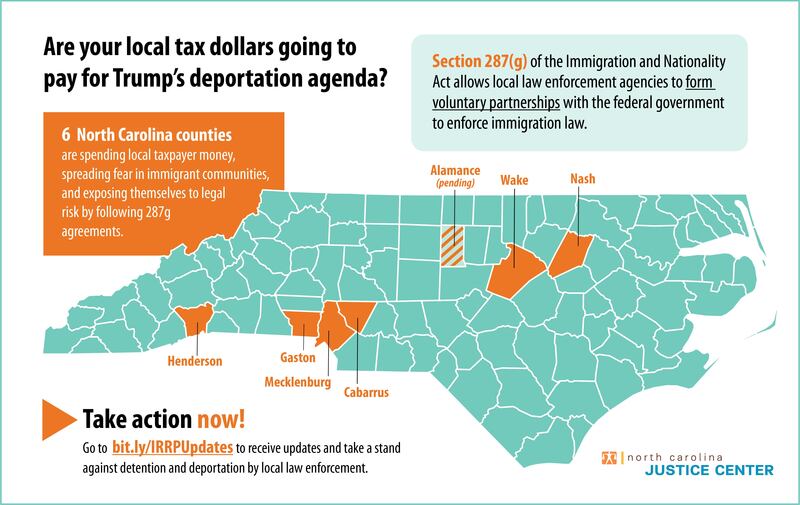 The NC Justice Center has been working collaboratively with partners and activists statewide on raids, deportation, and immigration enforcement issues for more than 10 years. Our raids workgroups and NC ICE Watch network are more important than ever, with Donald Trump in the White House and Jeff Sessions as Attorney General. The issues addressed in our collaboration range from 287g and SComm (the so-called "Secure Communities" program), to raids in neighborhood and workplaces, to racial profiling by local sheriffs. Together, we can monitor what's happening in immigrant communities with local law enforcement and federal ICE agents, share the most up-to-date news, and respond in ways that protect our neighbors. Together, we can hold law enforcement agencies responsible for excesses and abuses of human and constitutional rights. Sign up today to join us. Thank you for signing up and joining our community as we hold law enforcement agencies responsible for abuses of human and constitutional rights. Keep an eye out for updates and contact dani@ncjustice.org with any further questions.